A debut album of original solo piano compositions that come from the depths of her heart and soul, this is a dedication to Janine's piano teacher and life long friend, Margriet Pendavingh whose teacher was taught by Franz Liszt. This CD is a dedication to Margriet Pendavingh who was my classical piano teacher for 13 years. She gave me my first piano lesson when I was 8 years old, beginning our 44-year friendship. Her piano teacher was taught by Franz Liszt . In April 2015, I visited Margriet in Melbourne, Australia and invited her to play something with me on her two grand pianos. Improvising as a classically trained pianist was out of her comfort zone, but she willingly agreed. She said, “I’ll do it with you as long as you stay in the key", to which I replied, "I'll start in A Minor". The qualitative and emotional characteristics of the key of A minor are said to be tender, thoughtful, reverent, womanly, graceful, and capable of soothing. This was the perfect key for us to start in. It was a significant full circle moment where I, as the student now an adult, lead the teacher in an improvised spontaneous creation. It would be the last time I saw her. Thank you Margriet, for being my greatest inspiration. 1. Here I Am: Bringing my music, and in turn my self, my soul, my heart to the world. Where to start? I’ll Start in A Minor. 2. The Light: My grandmother Nunziata Cincotta, paid $100 for my first piano. I did not know at the time, but that piano would shine a light for me on the rest of my life. This piece is for her for showing me the light. 3. For Margriet: What can I say about a woman who welcomed the 8 year old me with open arms, who taught my little fingers to play, who nurtured and guided me throughout my years as a student, and way beyond that as a friend? What can I say about a woman who welcomed once again the 48 year old me and would guide me through the rehabilitation of my two broken wrists, so I could play again? Margriet was someone I loved dearly and someone who gave me more gifts than she could ever have imagined. Her wisdom in all things, her passion for life, her love of music, and her unconditional love of me. As I reflect on her life, I celebrate someone who gave so much of herself to others, who saw the passion and gift of music in me and gently, and sometimes not so gently, guided me on a path that would open up a world to me that I only ever imagined in my dreams~ the world of music that I walk in every day. Margriet, I hear your voice and feel your love in every note I play. 4. Freedom: This is an expression of that feeling of being on an open road, heading in the direction you want to go, being released, running free, with no where to be and everything to see. 5. Just Play: For all the encouragement from my father Tista and my mother Nancy to just play. Thank you for the years of piano lessons, for being beautiful parents, believing in me and allowing my gift to blossom. 6. Over and Over: As I move forward through life, I often reflect on those patterns that appear and re-appear. When we realize the path may not take us to where we expect, but we choose it anyway, learn the lessons it provides us, until the opportunity arises again and the fork in the road appears, over and over again. 7. Hello San Francisco : On a visit to San Francisco in 1998, I was led by some friends to a piano bar and invited to play. This is what I felt that night, inspired by the people around me. It would be the first piece I ever played to an audience in the US. 8. Reaching Upwards: Breaking both wrists at the same time is never a good idea for a piano player. This piece represents, the fear, the struggle, the uprising, recovery and eventual return to doing what I love. I am forever grateful to my family and friends, who helped me to re-gather myself through the uncertainty, and encouraged me to continue to reach upwards and start again. 9. Answers: Floating away on a thought, the piano is often where I go with a question. It often provides me with answers. This piece came from a time when I had a big question to ask. The answer lay deep within this piece. 10. Reverence: When I sit at the piano I feel I am sitting before my altar. I always feel a deep sense of grace, gratitude and reverence to be able to play and have a new appreciation for the gift I have been given, which was taken away and returned to me. 11. Awakening: This piece came at a time when I felt my heart awaken and open to greet and carry me to a place that is familiar, safe and warm. It will forever be for Melanie. 12. If I Can Reach You: We all feel a need for connection. My wish is to connect with you through my music. If I can reach you where you are, may it wash over your soul and bring you calmness and serenity. 13. I’ll Walk Beside You: For my sister Julie, for walking beside me through challenging times, and helping me make it through to the other side. Even though we are distant in miles, whenever you need me, I’ll always walk beside you. 14. Journey Home: There are many ways to journey home. I have journeyed home many times in my life. We will all eventually find ourselves on the path to our final journey home. This piece was written for my cousin Anne De Lorenzo, as she took her final steps on her journey home. 15. Through The Years: For anyone who has experienced the passage of time, and sees the many moments and memories of their lifetime flash before them like a movie. This is what I see. 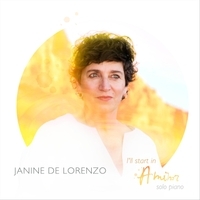 "I’ll Start In A Minor" is the debut solo piano album by Janine De Lorenzo, but she is no newcomer to the music world! The album is dedicated to Margriet Pendavingh, De Lorenzo’s piano teacher and lifelong friend until Margriet’s passing in 2015. Through her years of classical training, De Lorenzo often found herself creating her own music at the piano even though her teacher believed that any music that wasn’t classical was jazz and she had no tolerance for jazz. A native of Australia, De Lorenzo went on to complete her Bachelor of Education in Music. She taught classroom music as well as piano students, and became the pianist for an all-female cabaret-performing group. That experience led her to composing soundtracks for live theater, films and television. In 2003, De Lorenzo auditioned for Cirque De Soleil as was offered a position as keyboard player for the production, “KA,” at the MGM Grand in Las Vegas. Over the course of eight years, she performed in more than 3000 shows. In 2011, Cirque offered her the position of Musical Director for one of the traveling shows that was being created in Montreal. Within a month she fell while ice skating and suffered a concussion, and about a week after that, she broke both of her wrists - devastating events for a pianist. When she was able to travel again, De Lorenzo returned to Australia to be close to loved ones while she healed and recovered. Her piano teacher was living a few doors down from her mother and was able to help De Lorenzo rebuild the strength in her fingers and wrists so that she could play again. De Lorenzo returned to Cirque after about a year, touring with the show “Amaluna” as Musical Director before deciding to take time to channel her creative passions into her own music. What an amazing story, and what an amazing album! Recorded at Joe Bongiorno’s Piano Haven Studio in Sedona, AZ on his Shigeru Kawai concert grand, the fifteen original piano solos are warm, expressive and very beautiful. "I’ll Start In A Minor" begins with “Here I Am,” an elegant introductory piece that is very open, honest and heartfelt. “The Light” was composed in honor of De Lorenzo’s grandmother, who bought her first piano not knowing that the instrument would “shine a light” for the rest of her granddaughter’s life. “For Margriet” is the beautiful piece composed for that very special piano teacher. Overflowing with love and gratitude, it’s a piece that would bring a tear or two (or a few hundred!) to any piano teacher’s eye - a magnificent tribute! “Freedom” picks up the tempo a bit to express what it feels like to be on an open road “with no where to be and everything to see.” “Just Play” is a loving thank you to De Lorenzo’s parents for the encouragement to “just play.” The simple, poignant melody expresses so much with so little - compelling! The melancholy “Reaching Upwards,” reflects on the fear, struggles and uncertainty of recovering from her broken wrists and finding the courage to start again. The piano is where De Lorenzo often finds herself when she has questions, and “Answers” is the graceful, lyrical description of that process. “Awakening” is a love song, pure and simple. Expressed with tenderness and passion, it’s another favorite. The haunting “If I Can Reach You” is a piece about connection - especially through music. Open and uncluttered but very emotionally powerful, it’s my favorite track. “Through The Years” closes the album with a gentle reminder about the passage of time and moments from the past that often come to mind. Brava! "I’ll Start In A Minor" is an excellent and uplifting listening experience from the first note to the last! Very highly recommended!